This walk: 2016-7-20. Burrator Upper Quarry car park, kissing gates, Burrator Halt station, Burrator Dam, memorial benches, Sheep's Tor, Devonport Leat, Dartmoor pony, Peek's Hill Bridge, Dousland Reservoir, Yennadon Quarry. Walk details below - Information about the route etc. 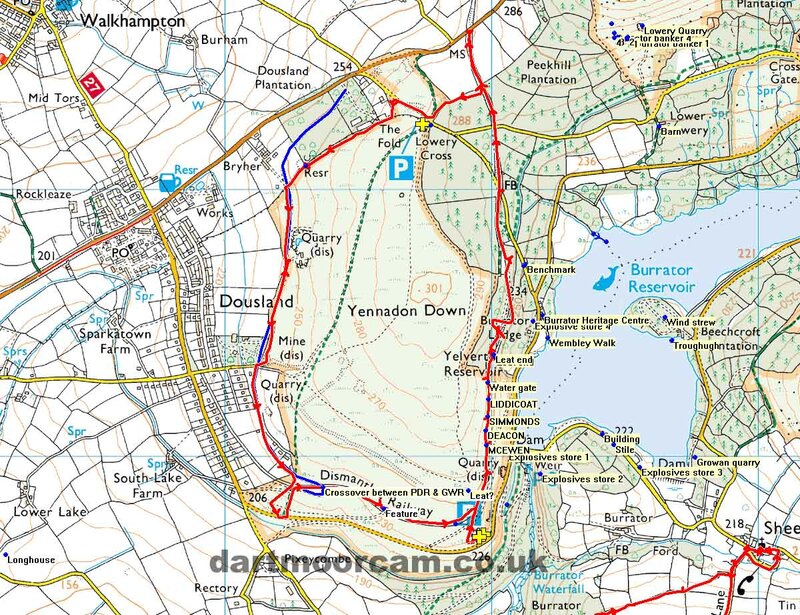 This walk follows the Burrator Railway Walk - The Princetown Branch and its Predessor leaflet, published South West Lakes Trust and available from the Burrator Heritage Centre (price 50 p). Eric Hemery (1983), Walking the Dartmoor Railways, David & Charles, Newton Abbot. Plymouth & Dartmoor Railway (Princetown to Crabtree Wharf), pages 11-21 and GWR: Yelverton-Princetown Branch, pages 102-107. Information board in Burrator Upper Quarry car park. Click the image to see a large version. For those who are curious, the Lower Quarry is just around the corner on the road to the dam - blocked off for many years to prevent car parking. Pink granite - the intrusion into the country rock as referred to above. One of two kissing gates at Burrator & Sheepstor Halt station that led down towards the dam and reservoir. Quite often, these gates alongside railways have posts and struts made from bent railway rails. The etymology of the name is that the gate merely "kisses" (touches) the enclosure either side, rather than needing to be securely latched - and I thought it was to do with old-fashioned philematology! On the left, the site of Burrator Platform, as originally named for workmen in 1924. who were employed on the raising of the Burrator and Sheepstor dams. It was opened to the public in 1925 as Burrator Halt and renamed Burrator & Sheepstor Halt in 1927. The history of the P&DR can be found on the archived Plymouth Data web site and on Wikipedia: Plymouth and Dartmoor Railway. Overlooking Burrator Dam, with Sheep's Tor behind. Over there, somewhere, we once recognized a near-buried granite trough, hopefully on the end of this link: "Our trough". The view taken from behind the bench. The water movements have been confirmed by a contact in South West Water. There are other possibilities depending on water quality - if the leat water is of poor quality then good quality water is pumped from Burrator reservoir to Dousland treatment works. Dousland now supplies water down to Crownhill (Plymouth), Tavistock and Princetown. This is the normal arrangement, however, in times of drought or poor quality, SWW can effect various water movements to maintain good drinking water. For anyone interested in a more complete description of Devonport Leat, there is a dedicated web page HERE. For those who remember the doll's head story e.g. as seen on 8th June 2011, there is a brand new image of the head (rather, a 30-year-old copy of the head) HERE. Recycled granite setts from the horsedrawn tramway used as kerb stones on the leat. Looking ahead along the route of the GWR railway branch line towards Princetown. Looking of the edge of the cycle path / footbridge at SX 55032 69003 at the quality of abutment built for the old bridge when it carried the railway. Looking across to Sheep's Tor, SX 566 682, elevation 369 meters (1210 feet). Dartmoor pony using the wire fence as a scratching aid. Lowery Road Level Crossing: the area on the left, across the road, is where the cottage for the crossing keeper once stood. It ceased to be manned after 1927, after which road users were responsible for opening and closing the gates themselves. Someone said "Look, pink sheep"! Birds foot trefoil, Lotus corniculatus? Celandine poppy, wood poppy or poppywort, Stylophorum diphyllum. Covered reservoir at Dousland water treatment works - click here for Google aerial view. A railway connection - photo from 27th March 2013. House nameplate at the end of the private road. Looking back along the road / line of the old tramway, and the gate onto the moor with a passing place to its right. Sheep in the shade - not that it was very sunny today after the hottest day previously! Cattle creep, photo 2; built because the railway cut cattle off from parts of the open moor. This walk was reached easily from Dousland by parking at Burrator Quarry, marked by the P symbol and the yellow cross on the map. Distance - 6.37 km / 3.96 miles.